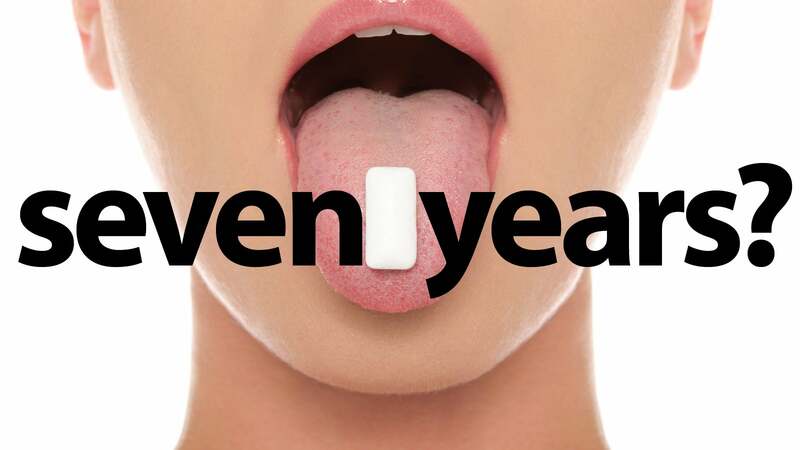 Does it really take 7 years to digest swallowed gum? We’ve all heard the myth: Gum takes 7 years to pass through your body. Growing up, I’ve always been petrified of swallowing gum, having heard horror stories of kids who need to have huge wads of swallowed gum surgically removed because it never digested. However, how accurate is this myth? I decided to investigate. According to the Food and Drug Administration, gum is a base that is a nonnutritive, masticatory substance made up of either synthetic or natural rubberlike materials, including plasticizing softeners, preservative antioxidizing agents, and resins. The components are often tree-derived, and gum can be traced to somewhere around 2,000 years ago in America, or a primitive form of it (FDA). Although this sounds complicated and worried, it ends up being a simple formula that is consistently delicious. However, is it dangerous for your digestive tract? Let’s investigate. According to livescience.com, this myth is false. Gum passes right through one’s digestive system just as any other food would, as your body has every capability to break down gum’s components over the course of a few days, including oil derivatives, sweeteners, and the rubber or latex base, which can take slightly longer. However, the author of this study, Joseph Castro, does not recommend swallowing gum, as in some cases, children have in fact needed gum surgically removed if enough is swallowed in a short enough amount of time, causing constipation. Scary stuff… let’s take a look at another study. In the next case, we look at John Matson’s research in his article for the Scientific American. According to Matson, this myth is still false, as it is impossible for anything to stay in the digestive system for so long unless it was too large to physically be removed, such as something larger than a quarter. He agrees that the majority of gum’s components are easily broken down. However, a few are a bit more difficult than others (Matson). Although gum most likely passes through the system slower than many other foods, it will usually pass through with ease. However, Matson agrees that this doesn’t mean it is a good idea to regularly swallow gum, for the same reasons, as it has historically needed the rare but possible surgical removal if too large of an amount is present. In conclusion, it seems as though this old tale is rather innaccurate, and gum digests relatively easily, but perhaps slower. However, it remains in one’s best interest not to frequently swallow gum, as difficulties can occasionally arise, and why not just spit it out? It’s cleaner, quicker, and easier, anyways. Just don’t stick it underneath Andrew’s desk trays! This entry was posted in Uncategorized on October 21, 2016 by Grace Ellen Leibow. Cool topic! I have always wondered what happens after you swallow gum and how long it takes to get passed through the body because everyone has always told me never to swallow it. But I’m not going to lie, I like the occasion Blow Pop, but I kid you not- that gum is so easy to swallow! It kind of is concerning how gum can be processed and not get stuck in the body as you think it would get caught in your throat… The body is just amazing! Here’s an article on chewing gum and the effects it has on certain parts of your body- http://www.refluxcookbookblog.com/wp-content/uploads/2010/03/Rx-Gum-Chewing.pdf, thought you might enjoy this! This article caught my eye because I heard this myth many times as a child. One time when I swallowed my gum and someone mentioned the myth to me I was terrified as a young kid. While it doesn’t actually stay in your stomach for seven years there are however some possible side effects to swallowing your piece of gum. This article spells out six possible side effects of consuming your gum. This post addresses the myth that almost everyone has heard from their parents. When reading your blog post, I began to wonder not about the dangers of swallowing gum, but the dangers of misinformation. This leads to questions like, “how many people had problems because they believed the act of swallowing gum was bad?”. For someone like me, I definitely worry a lot so just that thought going through my head would be worse than the swallowing of gum itself. Really, it just comes back to the power of the brain and how many functions it serves without us even thinking about it. This is a link explaining how food is usually digested. Take a look! I think that this post gives a perfect example of one of the first things that we learned in SC200: Humans have a lousy intuition. It seems as if through time a large number of people started to believe that gum stays in your system for seven years, most likely with no scientific evidence behind it. Although this blog post tells us that it is not extremely dangerous to swallow gum, I do not think I am going to change my ways of throwing it out after the flavor has faded. While weighing how easy it is to just take the gum out of your mouth and throw it in the trashcan with the rare but possible negative effects on your body from swallowing it, I think that it is logical to make the effort and play it safe. Really interesting post. As a frequent gum-chewer, I have been curious about the whole “don’t swallow gum” ordeal. I’ve never had a problem with it as I believe it to be false, but I could see how it would take a while to digest. This Yahoo! article had some interesting opinions about swallowing gum as well: https://www.yahoo.com/beauty/is-swallowing-gum-dangerous-118386750632.html. Definitely a pretty cool idea for a blog topic.